Scam artists are always looking for new ways to cheat Iowa’s casinos out of money. Now, Iowa law enforcement officers have a facility where they learn how to spot those individuals. The DCI Gaming Training Lab is located in the Department of Public Safety building in Des Moines. DPS Director Gene Meyer says it will help the 120 DCI agents who provide security at each of Iowa’s 17 race tracks and casinos. Meyer says the lab will allow those agents to "stay at the top of their game" as they work to understand new ways gamblers are cheating casino games. In the last three years, DCI agents have resolved more than two dozen cheating cases in Iowa. "There’s no question that professional cheats travel across the country and try to cheat casinos. That’s what we’re always on the lookout for," Meyer said. 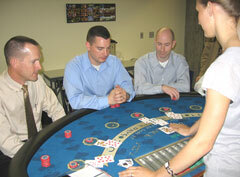 The DCI agents often wander Iowa casinos, mostly observing gamblers. But, sometimes, they actually participate in the games. "In addition to that, we travel around the United States and sometimes around the world doing background investigations on those people that are owners and operators in the gaming industry and people that provide supplies to the gaming industry. We’re very concerned about where their money comes from, we want to make sure all that money is clean money," Meyer said. The new Gaming Lab in Iowa includes various slot machines, plus tables for poker, black jack, craps and roulette. Meyer says, previously, agents were sent to training sessions in Missouri, Las Vegas or New Jersey. Now, they’ll be able to undergo training in Des Moines. "We’ve selected three or four agents to become highly specialized in each one of these games, so they can then turnaround and train their peers," Meyer said. The cost of the gaming lab is estimated at $18,000. 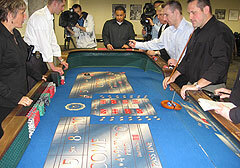 The gaming tables in the lab, which were donated by the casino industry, were refurbished and include the Iowa DCI logo.